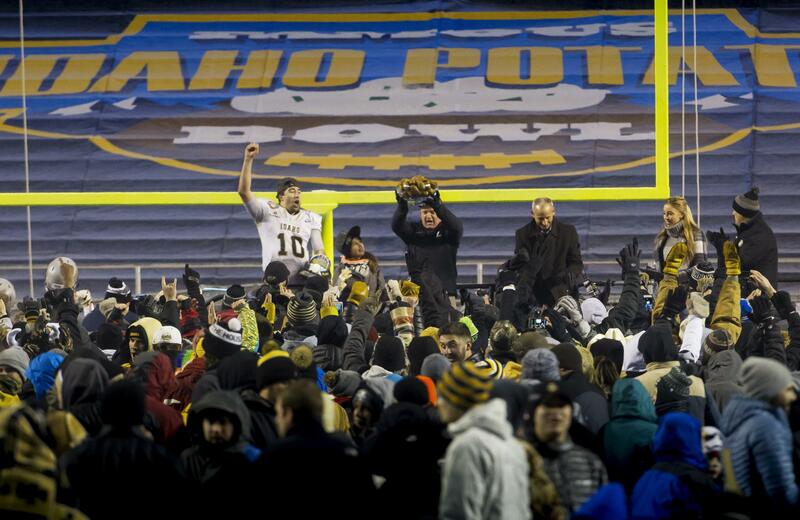 MOSCOW, Idaho – The University of Idaho football team made its statement last week in the Famous Idaho Potato Bowl. Now a Vandals booster is trying to make another one. Tyler Williams, 33, of Lewiston, started an online petition to keep Idaho in the FBS, the NCAA’s highest division of college football. As of Thursday afternoon, more than 1,000 people – including current and former UI players – had signed the petition. In April, UI announced it will become the first school to go from the FBS (formerly Division 1-A) to the FCS (formerly Division 1-AA) and the Big Sky Conference in football in fall 2018. Idaho competes in the Big Sky in all other sports and was set to be without a football conference after the Sun Belt booted it, effective after the 2017 season, in March. “The big reason we started this petition was because boosters, alumni and fans alike were all pushed aside and completely left out of this decision,” Williams said. “It kind of felt like president Staben made the decision all by himself without doing the process right. A UI spokesperson didn’t respond to an email about the petition. In earlier interviews, Staben and athletic director Rob Spear said Idaho would have to invest $5 million if it remained in the FBS. Financial concerns, combined with the fact that no FBS conference was interested in UI, were big factors in the school’s decision. Like thousands of Idaho fans and boosters, Williams was in Boise to watch the Vandals manhandle Colorado State, a two-touchdown favorite from the Mountain West Conference, for most of the Potato Bowl. The 61-50 victory pushed Idaho to a 9-4 record, its best season since 1998. In an ESPN Radio interview after the game, quarterback and game MVP Matt Linehan referred to Staben as “tone deaf” while arguing that Idaho belongs in the FBS. Linehan apologized to Staben in his postgame news conference. Other players, including tight end Trent Cowan, have been critical of Staben’s decision. But it’s not just players that have spoken out. Spear said in October that fundraising and ticket sales were down “enough to hurt” because of the move. The Spokesman-Review reported that Cowan’s grandparents, Bob and Jan, have decided to pull their annual $100,000 donation to UI because of the FCS dropdown. Former Vandal Scholarship Fund president Hugh Diener also told the S-R that he and his wife would stop giving to UI. Williams, the owner of a Lewiston construction business, hopes to get 5,000 to 6,000 signatures on his petition, equivalent to about half of UI’s enrollment. After that, he wants to start compiling legitimate pledges from donors who would give to the school if Staben reverses course. “I think he’s pretty set in his decision, but money talks,” Williams said. Published: Dec. 29, 2016, 6:17 p.m.